This exhibition features the artwork of St. Petersburg, Florida artist Rachel Stewart. Stewart is inspired by the markings of nature, the results of changing formations caused by the nuances of time and seasons. The content of her work draws from observing and interacting with nature and translates her memories into abstract forms. Stewart primarily works with wood – constructing and deconstructing discarded wood pallets and gouging, burning, and painting layered surfaces. 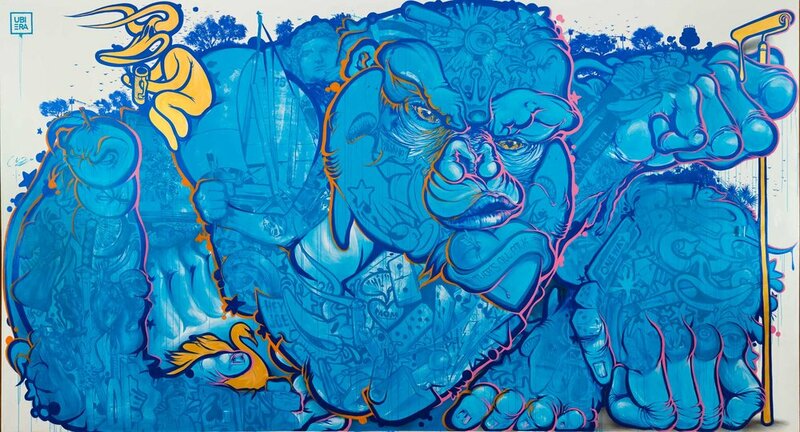 Ruben Ubiera, Monkey Business, Painted mural, 16' x 24'. 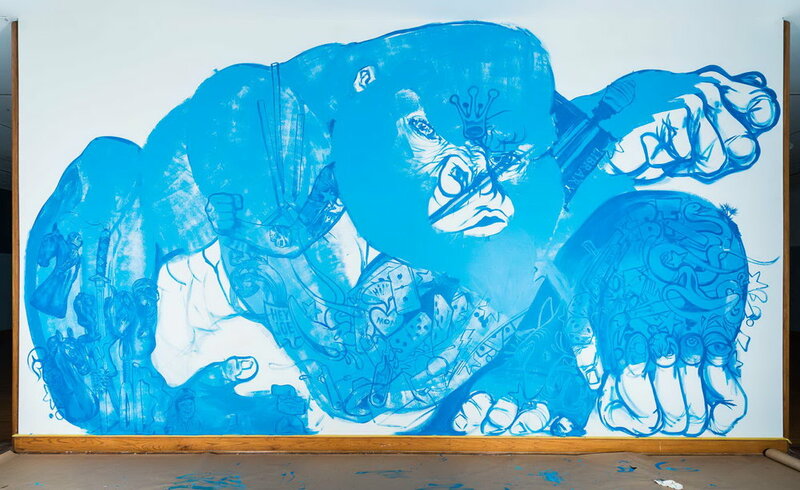 For the first time in its 50 year history, the Polk Museum of Art partnered with an accomplished Florida artist to produce an on-site, large-scale interior mural. Florida artist Ruben Ubiera designed and created a unique mural measuring 16’ x 24’ directly onto one of the Museum’s most prominent walls. This is the Museum's first on-site mural project and Ubiera's first major museum commission. Given its history of support for accomplished Florida artists, the Polk Museum of Art has chosen to work with Miami artist Ruben Ubiera. A native of the Dominican Republic, Ubiera moved with his family to the Bronx, NY, where he was influenced by the city’s gritty street graffiti. Now working in Miami’s Wynwood Art District, Ubiera contributes to the area’s recent nomination as a capital for sophisticated public street art. Inspired by man’s relationship with the urban environment, Ubiera combines concept and technique with narrative and an old-school essence of graffiti. This new style of street art is often referred to as Postgraffism, or according to Ubiera “urban-pop.” His murals embody a new spirit of urban aesthetic, distanced from the old perceptions of unrefined graffiti. He considers himself one of the “neo-illustrators and designers who are experimenting with new media, but have been influenced by graffiti . . .” He has certainly distinguished himself as belonging to a new generation of street artists. You can learn more about Ruben Ubiera at his website, http://www.urbanpopsoul.com. Special thanks to the community of supporters who made this project possible through donations to the Museum's Kickstarter campaign. Sultan’s still-life compositions, which range from huge pieces of fruit, vegetables, and eggs to dominos and flowers, dominate the surface of his paintings, drawings, and prints. Their bold forms demand attention by virtue of their medium, color, and size. While his works deal with recognized forms, they simultaneously and successfully combine the representational with the abstract. In Morning Glories, a sense of organic beauty is maintained even as the image is limited to black circles with white centers against a black and white patterned background. Sultan earned a BFA degree from the University of North Carolina at Chapel Hill in 1973 and an MFA from the Art Institute of Chicago in 1975. While still in school, Sultan grew dissatisfied with traditional methods of painting and began experimenting in technique, surface, and media, which eventually led him to use industrial tools and materials. Sultan was one of the first to employ a wide range of industrial tools and materials, particularly tar, in lieu of traditional brushes and paints. This exhibition features artworks by students grades 9-12 from Polk County School District high schools. For more information about our Student Gallery, visit our Student Gallery page. As a non-profit art museum, Polk Museum of Art is largely reliant on the generosity of its community. Thankfully, the Museum has been blessed with an incredibly supportive community. New artworks added to the Permanent Collection are typically donations or are purchased with funds that have been donated. Donated artworks go through an intense selection process before being added to the Permanent Collection; in order to ensure the strength of the Collection, each artwork must be approved by the Executive Director, the Collections Committee, and the Board of Trustees. Currently, the Permanent Collection consists of over 2,300 artworks, and usually only 10-15% of these artworks are on display at one time. This exhibition will showcase some of the artworks that have joined the Museum's Permanent Collection in the last four years. Hung Liu was born in Changchun, China in 1948. She grew up in Beijing during the time Chairman Mao and the People’s Republic of China. During the Cultural Revolution, she was assigned to work with peasant farmers who became the subject for many of her early photographs and drawings. Liu eventually enrolled at the Revolutionary Entertainment Department of Beijing's Teachers College to study art and education. After graduating in 1975 she began teaching art at an elite Beijing school, Jing Shan, but later attended the Central Academy of Fine Arts where she majored in mural painting. In 1980 she began studies in the visual arts program at the University of California, San Diego. This particular print references the pivotal, yet often overlooked, role women played in traditional Chinese culture. It is one of several tributes by Liu to the manual labor performed by women throughout China’s history, but especially during the Cultural Revolution. She chose the mundane act of milling and left the laborers anonymous in order to emphasize the universality of the scene. One of Liu’s primary intentions behind works such as Working Women: Millstone is to explore the conflicts between personal and national identity. This annual exhibition features works from high school students in the 15th Congressional District. The exhibit is organized through the efforts of Polk Museum of Art and the offices of U.S. Rep. Dennis Ross. 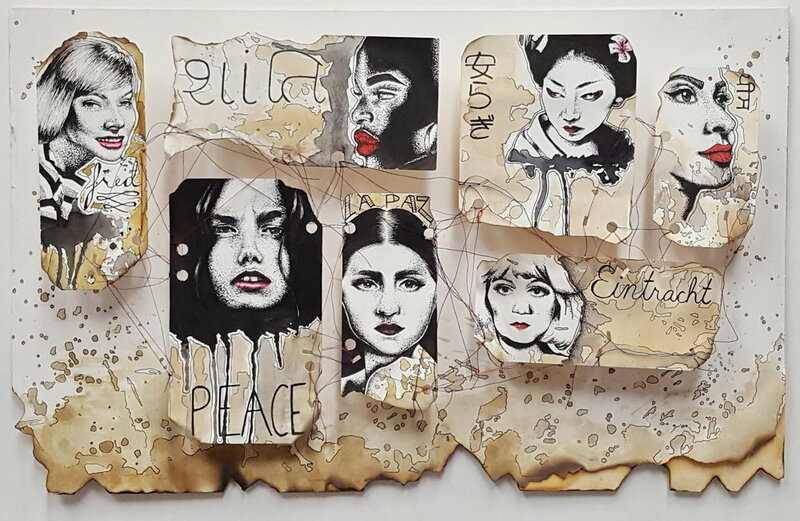 The Congressional Award winning piece will travel to Washington, D.C., to be displayed for one year in the U.S. Capitol along with other winning works from districts throughout the nation. Sponsored by: Joy and Mike Martin, Burnetti Children’s Foundation and Burnetti, P.A. Alison LaMons, a local emerging artist, uses vibrant watercolor to paint neon signs, both real and imagined. LaMons feels that combination of text and iconography in neon signs gives her the freedom and the vocabulary to shape her message. Georges Claude displayed the first neon lamp to the public on December 11, 1910, in Paris. Roughly a century later, neon lighting is becoming a thing of the past. For LaMons, a neon sign is the perfect metaphor for life in the 20th century – a “quintessential artifact of a culture, a century, and a country.” It encapsulates our consumerism, artificiality, and the ephemeral nature of it all. This exhibition is part of The Arts on the Park Series. Senior visual art students present their graduating body of artwork from the Harrison School for the Arts. Edward Willis Redfield (American, 1869-1965), Winter in the Valley, c. 1920s, oil on canvas, 36 x 50 inches, Museum Purchase, Reading Public Museum, Reading, Pennsylvania. This comprehensive exhibition features one of the Reading Public Museum’s greatest strengths – its collection of works by American Impressionists. The exhibition includes more than one hundred total works, including more than eighty oil paintings and nearly thirty works on paper dating from the 1880s through the 1940s. Outstanding landscapes – ranging from snow covered hills to sun filled harbors – seascapes, penetrating portraits, and remarkable still lifes, imbued with rich textures, reveal the artists’ interest in capturing effects of light and atmosphere in their work. The exhibition is arranged according to the artists’ colonies that played a critical role in the development of American Impressionism including those at Cos Cob and Old Lyme in Connecticut; Cape Cod, Cape Ann, and Rockport, in Massachusetts; New Hope and Philadelphia in Pennsylvania; Taos, New Mexico; and California. In addition, American expatriate artists such as Mary Cassatt and John Singer Sargent are examined. Other leading artists of the movement include William Merritt Chase, Childe Hassam, Ernest Lawson, Julian Alden Weir, John Twachtman, Chauncey Ryder, Frank W. Benson, William Paxton, Abbott Thayer, Guy Wiggins, Charles Webster Hawthorne, Colin Campbell Cooper, Daniel Garber and Edward Redfield, among others. Brazilian-born and Miami-made, Romero Britto is an internationally renowned, iconic pop artist that uses vibrant color, playful themes and hard-edged compositions to capture the attention of both youthful spirits and educated art collectors. Self-taught at an early age, Romero was encouraged to travel to the United States where Pop Art was flourishing. With an unshakable resolve and belief in his own art, Romero spent the next few years exhibiting and attracting the attention of many before coming into his own and traveling to Paris, where he was introduced to the works of Matisse and Picasso, which influenced him to create an iconic style that The New York Times described as, “exudes warmth, optimism and love.” It is this unique talent which has established Romero Britto's reputation and granted him widespread international recognition. Romero’s pop sensibility has lent itself to collaborations with international brands such as Audi, Bentley, CocaCola, Disney, Evian, Hublot, Mattel, and Technomarine, as well as with international sporting events like the FIFA World Cups in 2010 and 2014, and most recently, the Olympic Games in Rio in 2016, for which Romero is Global Ambassador. Romero Britto is an artistic activist for charitable organizations worldwide and most importantly, an artist who believes "art is too important not to share." He serves as a benefactor, donating time, art and resources to more than 250 charitable organizations. A firm believer in the role of an artist as an agent of positive change, Romero Britto is committed to developing and supporting the powerful role art plays in world issues. Romero’s work evokes happiness and hope using a visual language all its own that is simply relatable to all. This exhibition highlights the artwork of Polk County School District senior high school students. Tracing Antilles is an on-going project produced by multi-media artist Humberto Castro. Based on a series of historical and visual explorations of the islands of Greater Antilles (Cuba, Haiti and the Dominican Republic, Puerto Rico, Jamaica, and the Cayman Islands), the artist investigates the evolution of culture in this highly complex region. The work does not aspire to be a chronological account of historical events, but seeks to explore impressions, or traces, of collective experience that still influence the Caribbean psyche and artistic expression today. A key aspect of his project is that of the artistic journey, travelling through the islands and immersing himself in the culture. Many of the works incorporate found objects brought from the islands. Castro was born and educated in Cuba. He spent the first ten years of his career in Havana; then, in 1989, he immigrated to Paris where he lived for ten years, where he became active in the Parisian intellectual scene. In 1999, he moved to Miami where the confrontation with his own past and memory inspired him to examine his personal history of migration and displacement within the larger context of Caribbean history. Three works by Maxim, Four Winds, Time's Speed, and White Circle, were on display in the Taxdal Gallery through December. David Maxim is a San Francisco-based artist whose mixed media creations are about mythologies, the passage of time and natural forces. In many ways, these works are also connected to the themes of power and vulnerability: raging storms, human strength, psychological challenges and the impact of history. Maxim’s signature expressive style, with its energetic line and spilled color, contributes to depicting power and the anxiety of being impacted by that power. David Maxim’s work has been exhibited across the country and in Europe, and has been collected by many museums, including The British Museum in London, Museum of Fine Arts in Houston, Museum of Modern Art in San Francisco, the Nelson-Atkins Museum of Art in Kansas City, and Museum für Moderne Kunst in Frankfurt, Germany. Unforeseen Light: A study in reflection.